Reinforcingits credentials as a specialist supplier of quality heating and plumbing components for trade and consumer markets, Altecnic has received a coveted award from NSF International. Theglobal water testing, certification and auditing organisationhas recognised Altecnic'sadjustable T-type thermostatic mixing valves (TMVs). These products are the first to be TMV2-accredited against the recently revised 2017 version of the European Standards BS EN 1111 and BS EN 1287 which ensure thermostatic products maintain safe temperature water delivery for bath, shower and washbasin use. 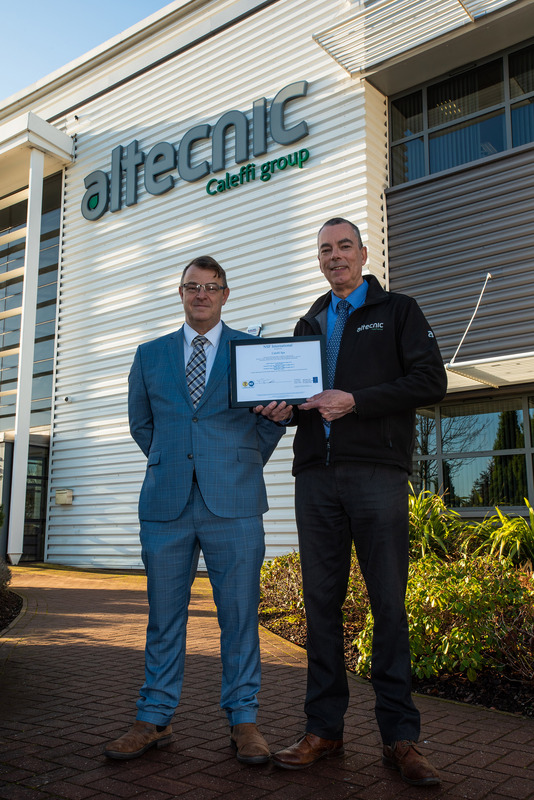 Paul Skinner, quality manager at Altecnic, said: "As a business we're proud of the quality and performance of our products so we're delighted to be the first company to achieve TMV2 certification, demonstrating compliance with the long-awaitedBS EN 1111:2017 and BS EN 1287:2017. "TMV2reassures architects, specifiers,consumers, retailers and regulators that our products have been rigorously tested and found to comply with all relevant requirements for safety, comfort, quality, sustainability and performance.Thisaward from NSF International reinforces our credentials andisa further example of how Altecnic is at the forefront of the UK's plumbing and heating industry when it comes to compliance with the latest standards." Paul Taylor, certification director at NSF International, who presented the award, said: "In granting theNSF Mark for TMV2-accredited valves against the 2017 version of the performance standardswe recognise not only Altecnic and Caleffi Group's current achievements, but also theirongoing commitment to technological innovation and pursuit of the highest industry standards." Caption:Altecnic has received a coveted NSF award for its TMV2-certifiedthermostatic mixing valves. Pictured (left to right) arePaul Skinner, quality manager at Altecnic and Paul Taylor, certification director at NSF International. Established in Stafford since 1987, Altecnic has positioned itself as the leading provider of high-quality heating and plumbing components for commercial and domestic markets. As part of Italy-based manufacturer and parent company the Caleffi Group, Altecnic has continuously developed precision products to satisfy the needs of a wide range of industry sectors such as trade merchants, original equipment manufacturers, engineers and specifiers, while complying with all UK and European industry legislation and standards.